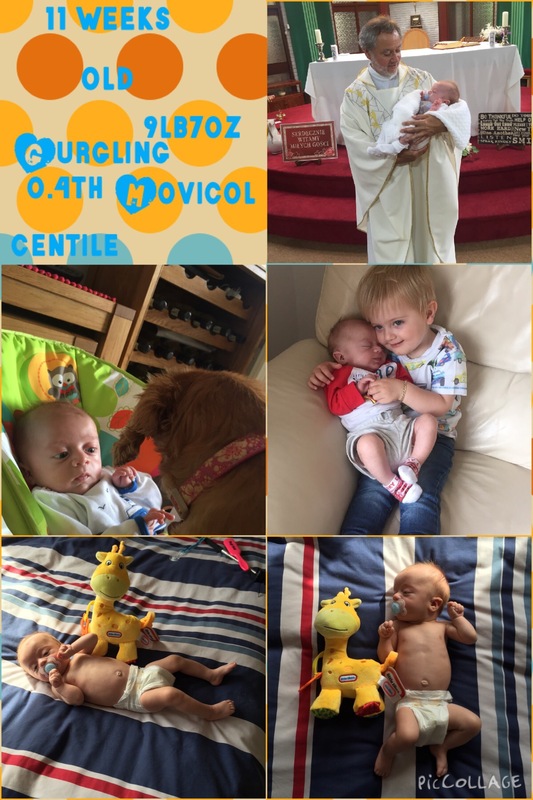 Another week has gone past as we hit the 11th week mark, who can believe that he is almost 3 months old!? This week Jacob weighs 9lb7oz, he is back up to the 0.4th centile now. On Sunday we celebrated Jacobs baptism, it was lovely for him to meet the rest of his family, and he was an angel all day ( a lot can be said for his older brother who has hit the terrible two’s Terribly). Jacob has a follow up appointment with another one of his pediatric consultants Dr Morgan at Serena children hospital, again more concerns have been brought to light again i will brooch that subject when i feel the time is right. Jacob also saw a pediatric dietitian who has now prescribed high energy formula for him, we will be following up with her this week. Developmental wise Jacob has been reacting to us verbally this week and will ‘coo and gurgle’ back to us when spoken to. This week he has finally started sleeping 6 hours and will go from 9.30-3.30, which feels like heaven to me. Jacob is still wearing newborn sized clothes however they are just starting to get snug and i can see him moving on up to 0-3 months within the next week or two. That is all for Jacobs 11 week update, keep your eyes peeled for next weeks 12th week mark update!